If the idea of another nerdy reality competition TV series fills you with dread... well, that’s kind of what the upcoming series Bruce Campbell’s Horrified is going for. 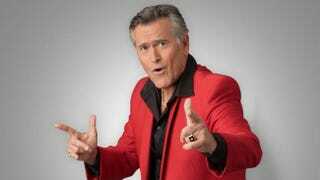 The good news is, obviously, that the impossibly charismatic Bruce Campbell will be involved. The bad news is everything else. The concept is still being fine-tuned but I hear the contestants would live together, possibly in a haunted house-type of residence, and will compete in a series of team and individual challenges, with each episode themed around a horror sub-genre, like monster, sci-fi, psychological, zombie, etc., completed with decors, costumes and visual effects associated with that genre. That doesn’t sound promising at all. Still, Bruce Campbell loves horror and appreciates the genre’s fans, even as he pokes fun at them—so he’s perfect for the show being described here. Plus, he’s been much, much, much more involved with fandom than the King of the Nerds hosts ever were, so it’s entirely possible he won’t allow the show to alienate his legion of fans, his people? Well, not only is his name on it, but he’s producing it, too... Maybe he can prevent this show from being a disaster. ...yeah. And maybe I’m a Chinese jet pilot.